Happy Day, Everyone!! 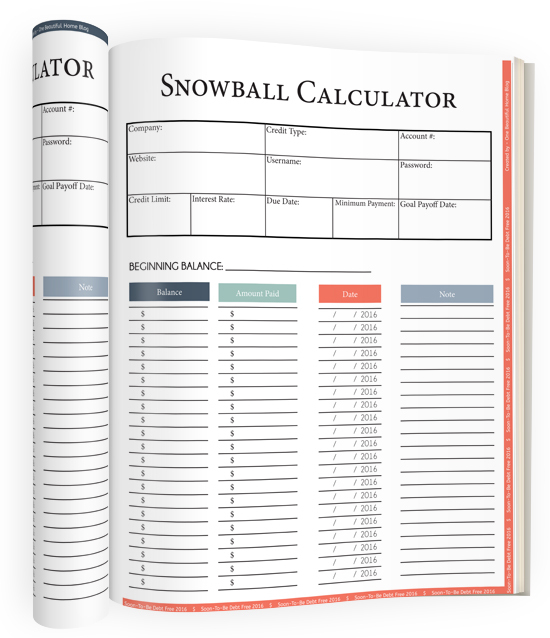 I have decided to release the 2016 Soon-To-Be Debt Free Workbook, a little early! I am absolutely loving the changes I have made to this version, and I hope that you will too! This is going to be a pretty intensive post – taking you through the entire workbook. So let’s get right into it! 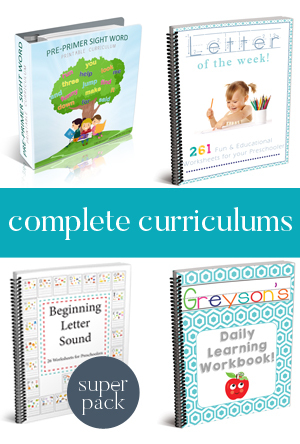 This year’s workbook has the same great content as the previous years- but with an updated look, and a few tweaks that will make it even better than before! 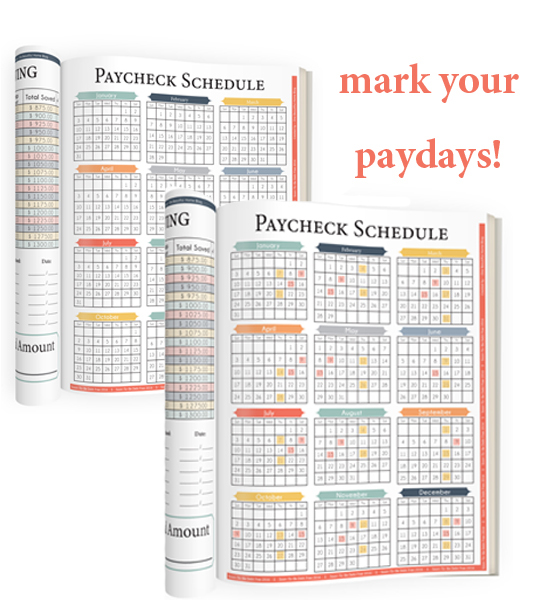 We start with the year of savings and our paycheck schedules. If you were here last year and followed through with the 2015 version, you would have saved a minimum of 1,300 with my year of savings! If you did not stick to it (or are new to this workbook) this is your clean slate – you absolutely CAN do this! If you succeed last year, then congratulations!! Pat yourself on the back, and keep going!! Last year I only marked Scott’s paychecks. This year I am going to be adding a few of my “paydays’ as well, and that will be exciting to see! These two pages can make or break you this year. Yes, you need all of them to be truly successful, but if you keep spending more than you make, you will never achieve the Debt Free lifestyle! Take your time! 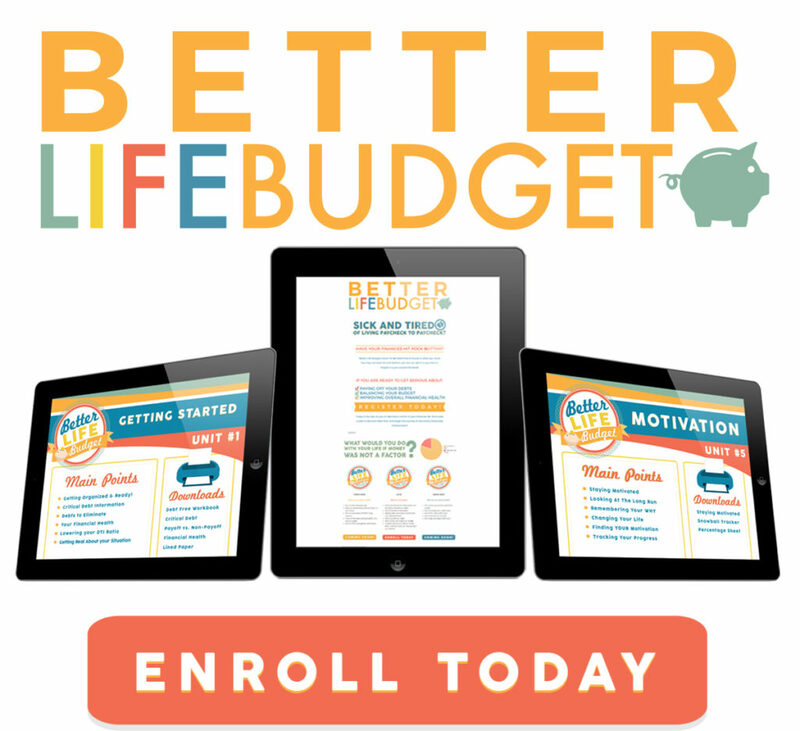 Really analyze your budget – figure out what you can cut out and DO IT. Remember the end game. 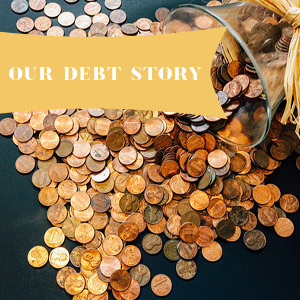 “Everyone thinks they are going to get out of debt” You can actually be one of those people! Do it for yourself, and your family! How do you find your percentage value? It is super easy. 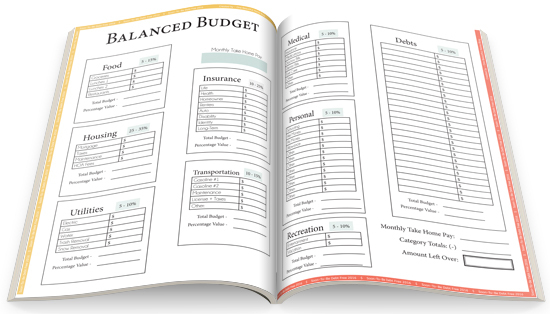 Simply take your total budget (for each category) and divide it by your monthly take-home pay. 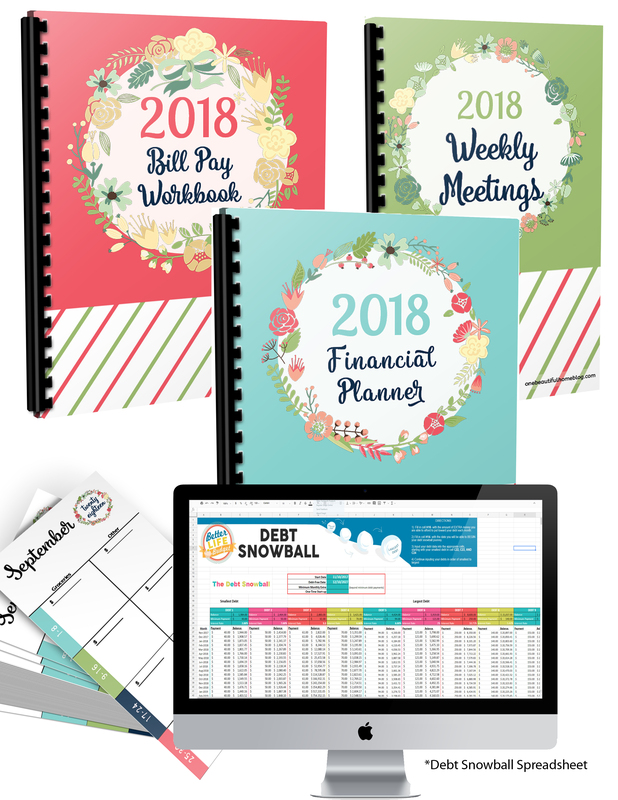 Once I started breaking our bills into two groups (Beginning and middle of the month) our finances started to take off in the right direction. 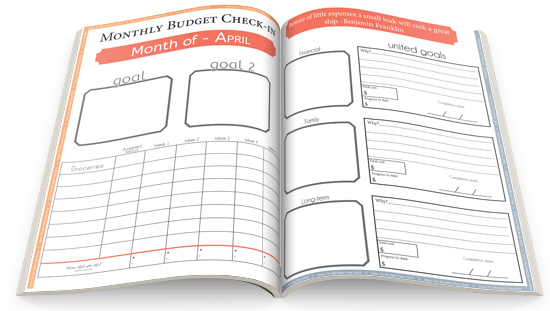 It is so much easier to budget and plan out in two-week chunks than it is a full month at a time. I know that Scott is paid every two weeks. He is guaranteed a paycheck by the 15th of every month. So I called our bill companies and had the bills that get paid with the first paycheck of the month due on the 16th The rest get paid with the second paycheck and those are due on the 28th. This way we are never ever late – and I know what bills get paid when – and the exact amount that comes out of our bank account twice a month. It is fantastic. 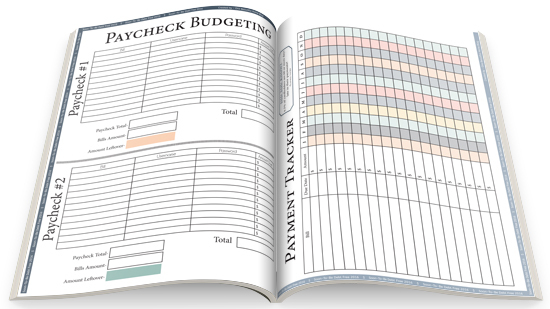 I use the payment tracker as a way to double check that the bills were paid that month and have cleared our account. Sit down and make a priority list of items/debts you want to tackle. This list can be any sort of thing. Do you know you’ll need tires for your car next season? 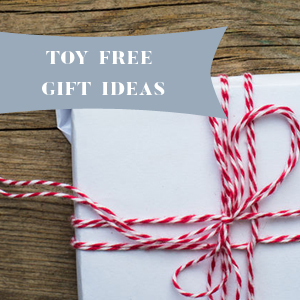 Would you love to splurge on a special gift for someone in your family? list it in order of priority on this form. 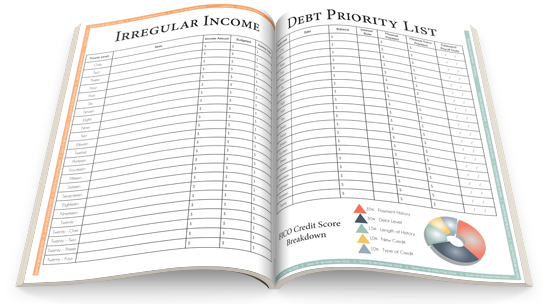 Since this is a workbook to get you debt free- I recommend that you list debts you want to eliminate! I am scattering debt payment amounts on this list. For example, Priority #3 is to put an additional 1,000 on a car payment. When you get an “Irregular Income” Put that amount in the Income Amount column and go as far down the list as possible based on the income. IE. You received $1,500 in Irregular Income. You’d be able to fully fund the New tires column, as well as the Extra Car Payment and $100 of the Fair Item. So, when the next Irregular Income comes in, you’d pick right up on Priority # 3 (Trip the fair) until that is fully funded, and then continue down the list. On a blank piece of paper list all of your Debts, along with their total balance! *don’t get sick! You can do this! Once you have them all, determine your debt payoff priority and get to listing them on this form. Make sure you take the time to locate the interest rate and your minimum payments. Most people recommend you paying your debt off from SMALLEST BALANCE to the LARGEST BALANCE. So you’ll get some “wins” under your belt quickly to keep up the momentum. One of my favorite pages! Pick your top 6 debts (That you listed already on your Debt Priority List). Each debt get’s their own page. Fill out the debt info at the top. Every-time you make a payment – whether it is a regular monthly payment OR an extra payment write down the date and amount, along with the balance. I love watching that balance decrease! It is such an amazing feeling, to finally write PAID across our student loan balances! It is so important to sit down every month and make a plan for those 30 / 31 days! If you are really committed to becoming debt free, you’ll end up loving planning day. Each time you sit down and write out your goals/plans you are are recommitting to this process. This is not an easy goal (To become debt free) but I promise you, it will be one of the best decisions of your life! Imagine what you will be able to do, once you do not have bills looming over you! Why? – Why is this your goal. You need to have a legitimate reason otherwise you will not stay motivated to complete it. Total cost. For the Disney vacation, lets say it will cost 3,000 to take your family there. $3,000 is your total cost of the goal. Progress to Date- How much progress have you made towards your goal already? Have you already saved $1,000 to go to Disney? Have you already paid $2,000 off that credit card? Put that figure here! Date to complete the goal by. You need a firm date to strive towards. I’ve found that without a date you’ll be more likely to cheat your budget. I made some changes to my bill pay worksheet, and I included it at the very end of the workbook. I still love this worksheet and use it every.single.time I pay bills. 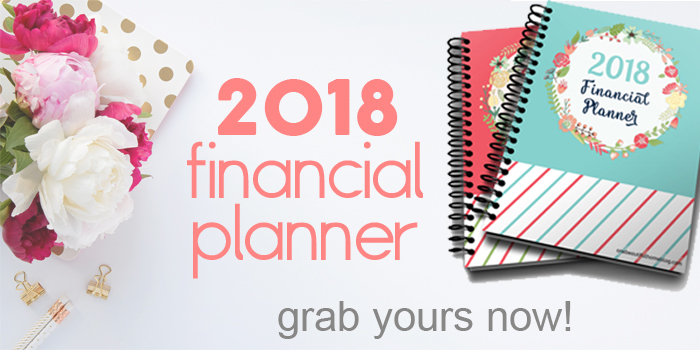 It keeps everything organized – and is a complete sanity and bank account, saver!! note- The checkboxes are for you to use once the payment has cleared your account, not when you send the payment. If you have made it all the way to the bottom of this post, give yourself a giant pat on the back! I hope all of you will join in, and start or continue on the quest of becoming and staying debt free!! 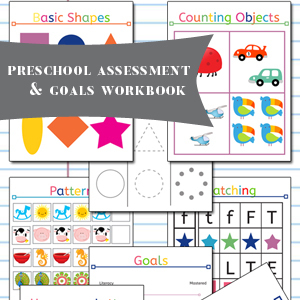 You can click HERE to purchase this workbook, for only $4.25! You will be automatically emailed a downloadable file, and can start immediately! Q- I just bought the workbook. How do I “get” it? Q- I really want to use this workbook, but our budget is so tight I cannot even afford the 4.25 price tag! Is there anything I could do? Q- Why are you making us pay for it this year? A- I really struggled with making whether or not to price this workbook. But at the end of the day this blog (and the products I create) is one way i am trying to help our family pay off our student loans. I did make it only 1.99, which is much less than my curriculum sets. I am sorry if this is frustrating to you. 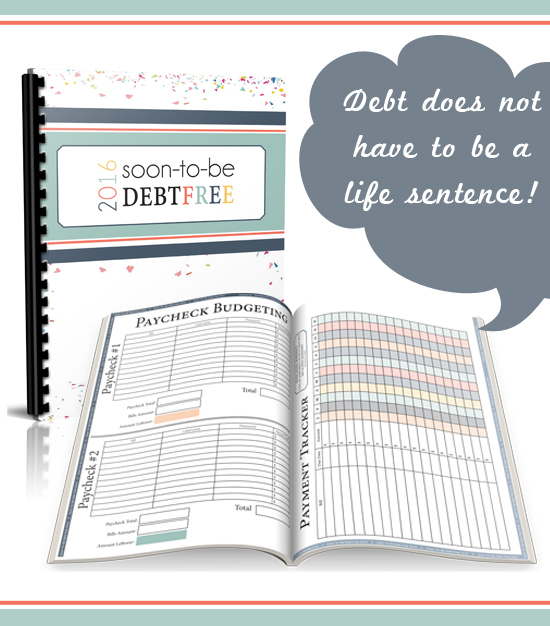 2015 Soon To Be Debt Free Workbook!! (1) What do you do with the years worth of savings ($1300) when you’re done? (2) In the budget categories I didn’t see a section for “savings”? I automatically distribute 10% of my paycheck to a “rainy day” account that I can’t see; do you think I should list my “take home pay” as the amount after that distribution? (3) What if you have money left over at the end of the month? Left over overall and in each category? Does each category just have an abundance of money the next month? and what if there’s an increase in pay or a bonus, does that fall under irregular income? (4) When setting goals, now that I’m divorced, it’s just me. No family and no kids. Any suggestions? I didn’t think I’d have this many questions LOL sorry for the interrogation, but you’ve honestly gotten me more inspired & hopeful than any other blog I’ve read (including Dave Ramsey!) lol Thanks in advance and much appreciated! Love the 2016 version! Thanks so much for your hard work. First time customer – LOVE your system!! Took Dave Ramsey’s course two years ago, still trying to find a system that works for us. Then I found yours. Can’t wait to get it printed out and start using it!! But I do have a question, that I can’t find the answer to on your website. When these pages print, do they print front and back, or front only? Thanks!! Hi. Thanks for your 2016 book! I’ve been using the 2015 book since summer, and it’s been so helpful. It’s time to work through my budget and fix things that were not working so I was very happy to get an updated book. Thanks again! I used several of your pages from the 2015 workbook and loved it. However, I could not use the paycheck budget sheets because I get 4 of them a month rather than 2. Do you have an option for 4 rather than 2 for the 2016? I tried making extra copies but because it said #1 and #2, my OCD wouldn’t let me HAHA! I made changes for the 2017 version- just for this specific problem! And trust me I could not deal with 1 and 2 when it is actually paycheck 3 or 4 too! 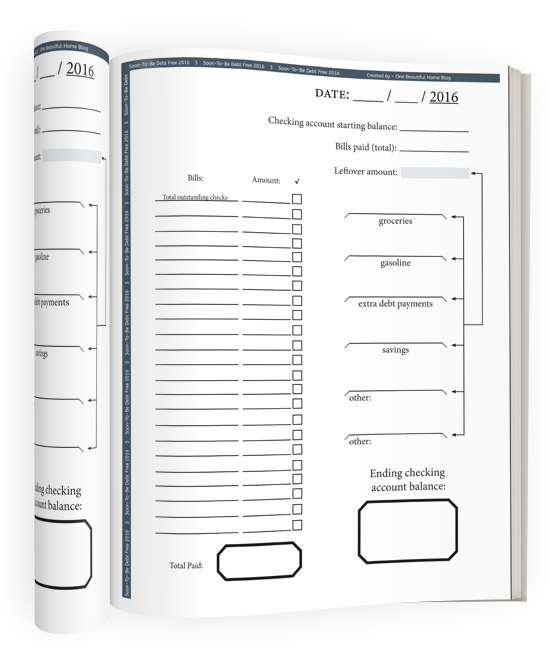 Will you be releasing a workbook for 2017? YES!! I am writing the post now. I LOVE 2017 version so much! I just found your system today and it seems that we think a lot alike when it comes to breaking down and organizing finances. I usually do a spread sheet format that I created but have been searching for one that had everything I needed in binder format. I can’t wait to purchase the 2017 version.